Accommodation in Rio de Janeiro is easy to book with Rioholidays. 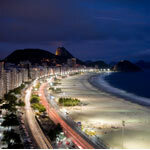 The short term apartment rentals in Rio de Janeiro have won a lot on popularity in the last years. 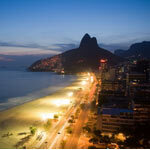 You can finde all kind of apartments in Rio de Janeiro. There are more economical options and hostels for the backpack travelers, but also luxury penthouses in Ipanema and luxury penthouses in Copacabana, which can satisfied the most sophisticated needs. 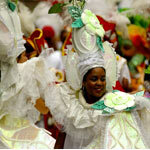 Rioholidays offer upper class and . We have very nice luxury apartments in Rio de Janeiro, located in the best areas of the Carioca capital. An even more luxurious option for accommodation in Rio are our penthouses in Rio de Janeiro. Arrival No matter if you are flying directly, or via Sao Paulo, you will arrive at Rio de Janeiro Int’l Airport - Antonio Carlos Jobim, which is located in the north part of town. The best way to reach the south part of Rio (Copacabana, Ipanema, Leme, Leblon), where your apartment in Rio located is, is by taxi or airport transfer service - both are comparable in price. Air Travel The two largest airlines in Brazil, TAM (Star Alliance Member) and GOL, connect daily to all major cities in the country. The prices are relatively high - comparing with Europe and North America. The air-bridge, between Rio de Janeiro and Sao Paulo, offers departures every 10-15 minutes and you don't really need to have a reservation. The rates vary between 180 and 350 Euros. Good deals you can get for flights to Buenos Aires. Banks are located on all major shopping streets. The largest are Banco Do Brasil, Real, Unibanco, and Itau. The foreign banks are represented by Citibank and HSBC - they have ATMs accepting Bankcards with the MAESTRO or CIRRUS symbols - Banco do Brasil (some machines only), HSBC, Bradesco. The apartments in Rio de Janeiro we offer you are located close to banks and exchange agencies. Rent an apartment or a pensthouse in Rio de Janeiro with us and be close to all what you might need. Beaches “The Beach” is a holy concept for the Cariocas, and they are heavily visited throughout the year. The penthouses in Rio de Janeiro we offer have amazing views over these beautiful beaches. Illuminated at night, the beaches are often utilized as soccer fields or volleyball courts until rather late in the evening. To get a better idea about which is the right beach for you, take a look at our Getting around section, with photos and descriptions. 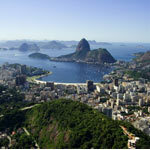 Get your apartment in Rio de Janeiro as close as possible to the area you prefer to stay. Buses (City) there are lots of buses on the streets of Rio, and they are rather loud. The bus system is somewhat confusing, at first. If you want to travel by bus, just walk down the street, and watch for your destination displayed on the front of the bus. Usually, you will not have to wait more than 5-6 minutes. The buses operate 24 hours, though less frequently at night. A bus ride costs about 1,20 Euro. The stops are almost on every corner, so that you need to walk just a little bit from your apartment in Ipanema or apartment in Copacabana. Buses (Outside-of-city) these are a very good method of transportation within Brazil for those who have more time and want to savor the landscape. Daily connections are offered between all major cities in Brazil, no matter how far your destination might be. The buses are very clean and comfortable, even for trips of more than 10 hours. The prices are very reasonable. Carioca/Cariocas native-born Rio Brazilians. They are very open, friendly and always willing to help. Rio De Janeiro was chosen as the International City whose citizens are most willing to help visitors (US-University survey, 2003). Cash You should not carry too much cash on the streets of Rio, and you do not need to bring much from home either. ATMs are the safest way to get Brazilian currency. There is plenty of counterfeit money in circulation (mostly 50 and 100 Real notes) – do not risk changing US Dollars on the street. Avoid displaying large amounts of cash, in public places. Our apartments in Rio de Janeiro and penthouses in Rio de Janeiro are equipped with electronic safes, so that you can store all your documents and valuables. 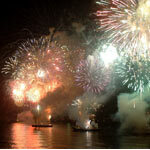 We recommend to use the safes in the apartments while you are in Rio de Janeiro. Credit cards these are widely accepted in Brazil. You can use them everywhere - in shops, restaurants, travel agencies, and night-clubs. The risk of credit card fraud at the big chain stores, malls, reputable restaurants and night-clubs is small; but if you feel unsure about paying with your card, use cash. Paying the rent of your apartment rental in Rio de Janeiro is possible only cash. If you want to use your credit card it should be done before your arrival in Rio. Crime metropolitan Rio is a place of economic contrasts, where the very rich and very poor live in direct proximity: this is one of the main reasons for the high crime rate in the city. However, you can easily enjoy a safe vacation in Rio. The south part of the city - Copacabana, Ipanema, Leblon, Barra - is much more sedate than the rest of the city, and hardly more dangerous than any big city in Europe or North America. Please take a look at our safety hints list. Eating out Rio offers an impressive range of restaurants and places to eat out, depending on your taste and budget. Baked goods, sweets, sandwiches, and juices can be purchased on virtually every corner. There are also many fastfood chains. If you need something more elegant, or crave a specific cuisine, please take a look at our restaurant list. Please note if a reservation is recommended. We can arrange reservations for our clients. Electricity power in Rio de Janeiro is supplied exclusively in 110 or 120 Volts. Money Exchange exchange money only in established exchange facilities or hotels, never on the street. Always ask about additional fees: commissions, taxes, etc. The best and safest way to get Brazilian currency is through ATMs. Almost all American or European Bankcards have the accepted CIRRUS or MAESTRO symbol on them, and are accepted at most banks in Rio. Favelas the slums of Brazil. There are plenty of them in cities like Rio de Janeiro and Sao Paulo. If you are interested in a favela tour in English, German, or French, please ask us for a guide. We do not recommend travel to these areas without a guide. Internet you'll find plenty of Internet cafés, especially in Copacabana, Ipanema, Leme, or in the malls. One hour costs 2-3 Euros. There are also weekly passes for 10 or 20 hours, and the price is close to 75 cents per hour. Kombis these are small vans carrying 9-12 people, which drive a scheduled route, mostly along the beach, and stop everywhere. They are a cheap, safe and quick alternative to taxis, if your destination is along their route. They are very good for travel between Leme-Copacabana-Ipanema-Leblon, and are available 24 hours-a-day. A ride costs 1,00 Euro; to Barra, 2,50-3,00 EUros. During rush hour, they can get very full - 4 passengers on a bench meant for three, which may be a bit unpleasant on hot days. Language the official language in Brazil is Portuguese. You can expect nearly-fluent English spoken mostly in hotels and good restaurants, but seldom on the street or in shops. Spanish and Italian are also good ways to make yourself understood when talking with the locals. Markets these are very popular in Rio. T-Shirts, souvenirs, wood or leather products , paintings - you can find almost everything. The best-known ones are in Copacabana (on Atlantica, near Hotel Othon Palace), Mon - Sat from 6 P.M. until midnight, and the Hippie Market in Ipanema (Praca General Osorio) on Sundays. Money the Brazilian currency is called the Real (plural: Reais). 1 Real=100 Centavos. There are notes of 1, 2, 5, 10, 20, 50 and 100 Reais. Be aware that there is plenty of counterfeit money in circulation, mainly notes of 50 or 100 Reais. The central Bank issued in 2011 new designed notes for 50 and 100 Reais, so you might get 2 different bills with the same value untill the odl ones are completely taken off the circulation. Noise a part of Rio that you will get used to. Noise is almost everywhere - on the streets, in the restaurants, on the beach. It gets quieter in Ipanema and Leblon in the evening. Post offices Correios display yellow, the National color of Brazil. Offices are located on every main shopping avenue and in the malls. Open from 9 A.M. until 5 P.M.
Shopping there are many large, modern malls in every part of the town, and offer anything you might need. Credit cards are universally welcome. The most famous malls are Rio Sul, Shopping Leblon and Barra Shoping. Subway Rio's subway (Metro) is relatively small, but very safe, clean, comfortable and reliable. It is the best way to reach downtown from Ipanema, Copacabana, Botafogo or Flamengo, and to return. From the last station General Osorio in Ipanema, you can take the modern metro buses to other parts of Ipanema and to Leblon. Tipping a tip of 10% is automatically added to your bill in almost every restaurant. If paying with a credit card, you might be asked to pay the tip in cash. Tipping in cabs is not common. The fare will usually be rounded up, so do not wait for your change. Travelers checks they can be exchanged at most banks, exchange stores, or major hotels. Travelers checks in US Dollars can be conveniently cashed at all provincial banks and authorized exchange locations. Vaccines necessary for some parts of Brazil, but not for Rio. Please consult your personal physician. Visas travelers arriving from Argentina, Uruguay, Paraguay, and other neighboring countries can enter with a simple photo I.D. Citizens of the European Union need only a valid passport for stays of up to 90 days. US, Canada, Australia, and New Zealand citizens NEED a visa to enter Brazil, and can NOT obtain it at the airport. Please contact the nearest Brazilian consulate in your country for information about visa regulations (getting a visa should not take longer than a week). Weather it never gets really cold in Rio. However there are a few gray days during the Brazilian winter.